Current recommendations regarding cutting height of alfalfa are designed to maximize yield while maintaining high quality forages and stand longevity. 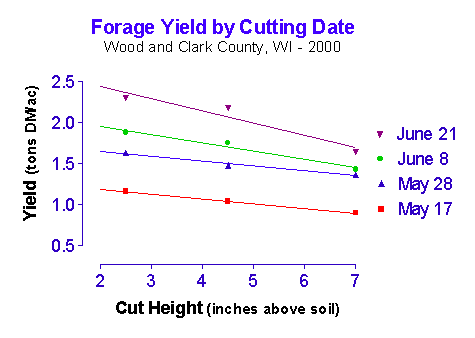 Forage growers frequently cut forages at a height of 3-inches or more. However, recent reports indicate that there may be an advantage to cutting alfalfa closer, leaving an inch or less of stubble height (@griculture Online, 1999). Research indicates that dry matter yields and nutrient yields are higher for shorter cutting heights as compared to leaving taller stubble (Sheaffer et al., 1988). Obtaining higher yields requires that the plants are healthy and that carbohydrate root reserves are adequate for plant regrowth following harvest. Wisconsin studies conducted in the 1960s using Vernal alfalfa showed that forages harvested three or four times per season produced more total forage when cut at a 1-inch height versus cutting at 3 inches or more (Kust and Smith, 1961, Smith and Nelson, 1967). Recent North Dakota research evaluating the effects of cutting height shows similar results where shorter cutting height results in higher yields. One of the reasons for leaving taller stubble is to improve the quality of harvested forage. The lowest sections of the alfalfa plant are typically higher in fiber and have fewer high quality leaves present. If growers raise their cutting height to leave these high-fiber basal stem sections in the field, they may increase forage quality. 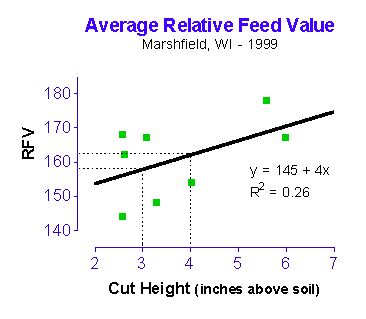 Research was initiated at the Marshfield Agricultural Research Station during 1999 to explore the relationships among cutting height, forage yield and forage quality. Additional studies were conducted in Wood and Clark counties during 2000. This paper will discuss the influence of cutting height on yield and quality of alfalfa. During the summer of 1999, two research trials were conducted at Marshfield, WI that evaluated the effects of cutting height on alfalfa yield and quality. One trial was harvested using small-plot equipment (Small-Plot Trial) and a second trial was harvested using a self-propelled haybine (Field-Scale Trial). 6-inch height for all cuts during the season. While we had targeted our lowest cutting height to be 1-inch, our equipment and soil conditions limited the cutting height to 2-inches. Actual cutting height was determined by measuring stubble height from 35 random locations within each harvested plot. Data will be reported based on actual cutting height for these studies. For the first two harvest periods, the field-scale plots were harvested 7-10 days earlier than the small plots. This allowed us to measure forage quality changes among the various cutting heights at early and late harvest times within a cut. Small-scale plots measuring 3-ft wide by 25-ft long were established on in an existing alfalfa field. These plots were harvested using a small-plot harvester and electronic weighing system. On each harvest date, a subsample was taken from each plot to determine forage quality. Harvest dates for these plots were June 8, July 13, and August 16. Field-scale plots measuring 12-ft wide by 150-ft long were established in an existing alfalfa field (1996 seeding, weed free stand). Cutting height treatments were made using a self-propelled haybine and forage was immediately chopped and weighed after cutting. Electronic pad scales were used to weigh each plot and a 1-lb subsample was taken from each plot for quality analysis. Harvest dates for these plots were May 25, July 1, and August 20. During the summer of 2000, cutting height studies were established at Marshfield and Granton (Clark County), Wisconsin. For the first cutting of the summer, alfalfa plots were cut on 10-day intervals beginning in mid-May and ending in mid-June. At each harvest date, cutting height treatments of 2-in, 4-in, and 6-in were evaluated for forage yield and sampled for forage quality. All plots were harvested with small-plot harvesters. Actual cutting heights averaged 2.5-in, 4.5-in, and 7-in based on measurements immediately after harvest. A second study was established at the Marshfield and Granton sites to evaluate 3-cut versus 4-cut systems. These studies were harvested three or four times during the summer with a small-plot harvester. The fourth cut of the 4-cut system was harvested in mid-October. For each cutting system treatments of 2-in, 4-in, and 6-in (2.5-in, 4.5-in, and 7-in actual height) were evaluated for forage yield and sampled for forage quality. During the spring of 2001 plots will be evaluated for stand to assess the impact of cutting height on alfalfa stand or persistence. Results from the small plot and field-scale trials in both years and all locations were similar for both forage yield and quality. Measurement of forage yield and quality from the field-scale trial was more variable, while trial precision was highest for the small-plot trials. 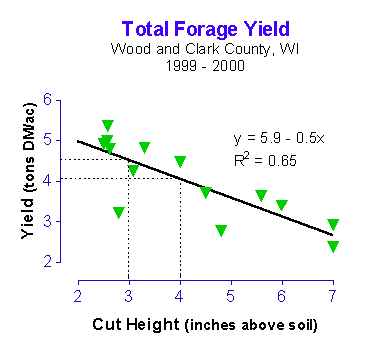 For each cutting, forage yield increased as cutting height was reduced. Significant differences among cutting height treatments were measured in all three summer cuttings (Figure 1). Very small or no forage yield differences were measured on fall cut (4th cutting) alfalfa plots. Figure 2 compares the cutting height effect of alfalfa harvested on different spring dates. The data shows that alfalfa yield differences among cutting heights is greater for alfalfa that is cut later in the spring (ie., is later maturity). On average, total alfalfa yield for the season increased by 0.5 tons DM/acre for each 1-inch reduction in cutting height (Figure 3). This is similar to the findings of researchers in North Dakota. Forage quality was compared using relative feed value (RFV). 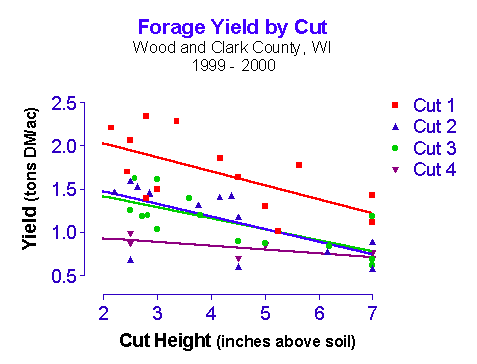 In general, as cutting height was reduced, forage quality decreased in 1999 (Figure 4). Overall, for each 1-inch reduction in cutting height forage quality decreased an average of 4 units RFV. These differences were present in each cutting, but most pronounced with first and second cut forages. Combining forage yield and quality into a single measure is accomplished by using the Milk95 spreadsheet that generates an estimate of milk yield per acre (Undersander et. al., 1995). For each harvest during 1999, the potential milk yield per acre increased as cutting height decreased. Totaled over the three-cut season, milk yield increased by 900 lbs. 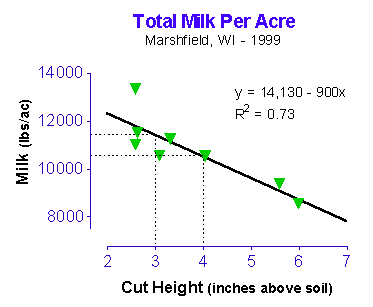 per acre with each 1-inch reduction in cutting height (Figure 5). This central Wisconsin research indicates that alfalfa yield and milk yield is highest when cutting at the lowest possible height. While forage quality declines with lower cutting heights, forage yield increases significantly. These studies were done on healthy, weed-free stands of alfalfa and soil moisture conditions were adequate during most of the growing season. Adjust cutting height to avoid injuring plants, contaminating the forage with soil, or picking up rocks. @griculture Online, 1999. Cut it close for best performance in alfalfa. http://www.agriculture.com, April 9, 1999. Kust, C.A., and Dale Smith. 1961. Influence of harvest management on levels of carbohydrate reserves, longevity of stands and yield so hay and protein from Vernal alfalfa. Crop Sci. 1:267-269. Sheaffer, C.C., G.D. Lacefield, and V.L. Marble. 1988. Cutting schedules and stands. P. 411-437. In A.A. Hanson et al. (ed.) Alfalfa and alfalfa improvement. Agron. Monogr. 29. ASA, CSSA, SSSA, Madison, WI. Smith, Dale and C.J. Nelson. 1967. Growth of birdsfoot trefoil and alfalfa. I. Responses to height and frequency of cutting. Crop Sci. 7:130-133. Undersander, D. J., T. Howard, R. Shaver, 1995. MILK95: Calculating Forage Milk Per Ton of Dry Matter and Per Acre. Univ. of Wis., Madison, WI.